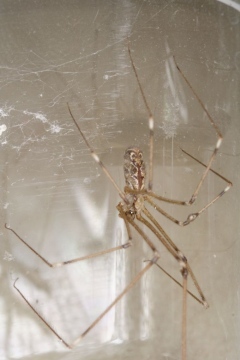 In this country the daddy long legs spider Pholcus phalangioides is found indoors in houses, outhouses and cellars etc. It favours undisturbed parts of houses where its untidy web passes unnoticed or is permitted to stay. It is widespread in the southern half of Britain, but scarce and rare in the north. There are indications that climate change is enabling the spider to become more frequent further north and even to occasionally occur outdoors. Don't confuse with daddy long legs craneflies (which have two wings) or harvestmen, which also have long legs. Please note that a new species Holocnemus pluchei has been found established indoors in two locations in southern England, and is very similar in size and appearance. We are keen to find out whether Holocnemus pluchei is more widely distributed, but has been overlooked. 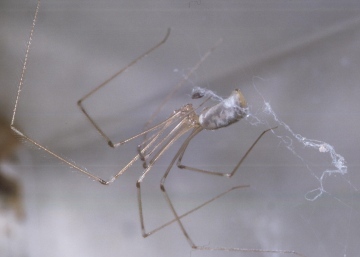 If you are not sure whether your spider is Pholcus phalangioides, please contact us.